In honor of October Unprocessed and in the spirit of this sniffles and soups season, I thought I'd throw a whole food and wholesome recipe up on the blog. I can't take credit for this recipe, as it comes straight from my Frenchman and his culture- both of which ceaselessly surprise me with their ability to create delicious and simple dishes with whatever seasonal (and more often than not inexpensive) ingredients on hand. The French love their potage- a simple blended vegetable soup that they believe makes you grow stronger and taller. While an increased growth rate isn't immediately evident upon eating potage, the health benefits seem instantaneous. A wave of warmth runs over you as you soak up all the nutrients from these earthy vegetables, fortifying your immune system for the cold weather to come. 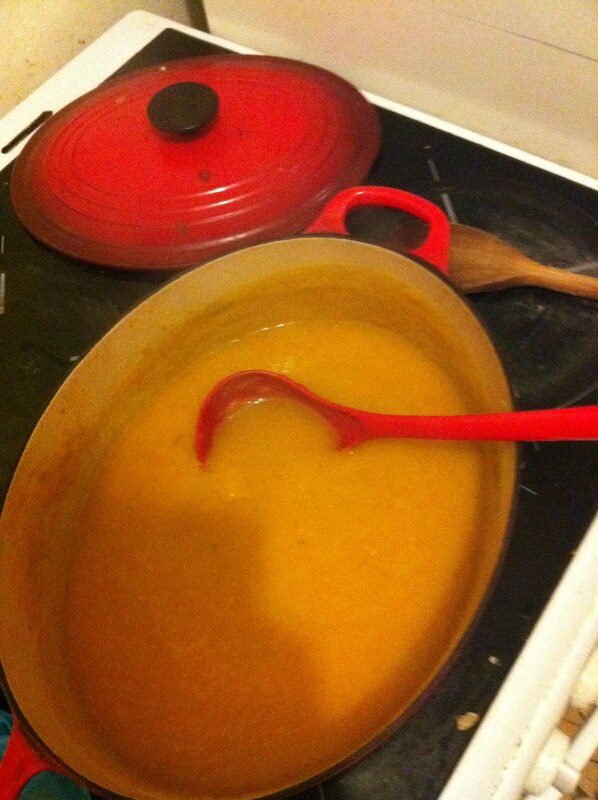 This soup meets the Unprocessed October challenge by using only whole ingredients and I encourage you to pick these ingredients up from your local producer, being both seasonal and easy to grow in any region in France, the ingredients will be both abundant and inexpensive. So prepare yourself for the seasons changing and a cold front coming in by applying this brothy bandaid. This recipe yields a bunch of soup, so you'll have plenty to save and share with others! 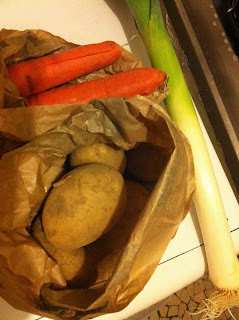 Step 1: Thouroughly wash all your veggies. 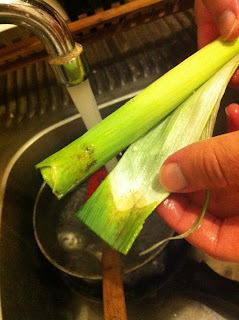 Take particular care with washing the leeks, loose dirt often hides in the folds of the leeks and so you should go through all the layers of the legume, rinsing with cold water and rubbing away at any hidden dirt. Step 2: Chop up the veggies, onion, and garlic. Cut them up in cubes throw them in a big pot. 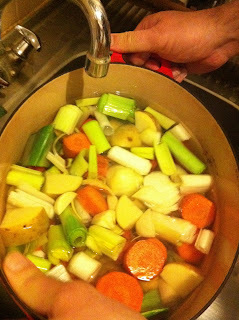 Step 3: Fill the pot with just enough water to cover the vegetables. Step 4: Return pot to stovetop, turn heat on to medium and cover. Leave on medium heat for about 10 minutes, or until the vegetables are tender. Step 5: Use a handheld mixer or transfer veggies to a blender (if you are transfering, be sure to transfer all the water as well, this contains tons of good nutrients and also is necessary for blending). Mix until you reach the right consistency- no big chunks, but not to watery. Step 6: Season with salt and pepper and serve. You can serve with crême fraiche, which can be mixed in to create a creamier potage.